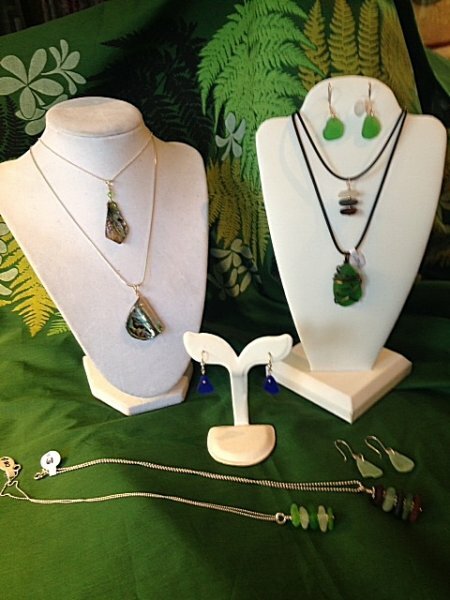 Nancy Allen has collected sea glass in the Monterey/Seaside area for many years, and we are fortunate to have her jewelery in our cabinets at Island Home and Garden. There are earrings and necklaces in shades of green, cobalt blue, and turquoise (all set in sterling silver) and Nancy’s latest designs include some pearls and abalone with the sea glass. Please refer to our Local Artist’s Page for more information regarding Nancy’s work.